its been pretty cold here, so we are pulling out the sweaters from the closet. Todays outfit revolves around this sweater. Knitwear can be boring if not worn properly. 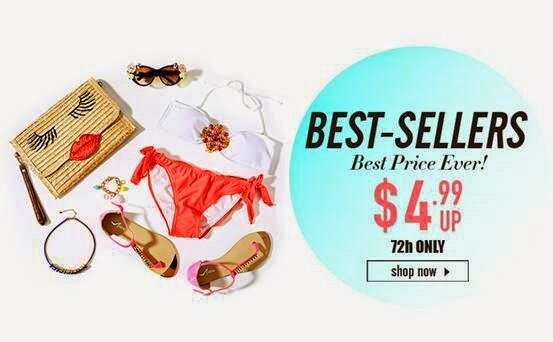 Dont forget to check out Romwe flash sale below you could get fantastic pieces. Thats all for reading. Have a great weekend. Stay Glamourous. Thanks alot for reading and we wish you a fantastic weekend. great post! Would you like to follow each other on GFC & Bloglovin? Let me know so I could follow you back. Happy Friday dolls, love your ripped jeans and the color awesome knit you look fabulous like always. The first image is so cute! Cute pants! Wonderful outfit, you look amazing! Wow! Love your Pants! Perfect look! Happy Friday! I love the knitted sweater and I really like the necklace you are wearing. I really like the colors in your outfit, awesome match!! So pretty - love your orange jeans. They look perfect with your fierce heels. Have a beautiful weekend! This look is gorgeous, i love the pants colour for the summer. Definitely not boring casual look! I like this combination. great post. i love those orange jeans. I love your orange ripped jeans! TGIF & that's a cool pair of pants you've got there! Yes of course, I am following you now, can you please follow me back? I love knitwear! So comfy. Great jeans! I don't like orange, but I like to much your pants! My idea is the same, accessoring is a smart solution to make boring pieces attractive. Fab look! Love the ripped pants. Happily we are enjoying hot weather in Spain. Have a fabulous Sunday! the shoes and jeans #rock!! Wow! you look gorgeous on that jeans dear! love it!! cheers for Fridays! ehehe sorry for the late Sunday comment lol..
What a cool look! love these colors together! Great look! I like the orange pop colored pants! This makes me so ready for sweater weather! Fun outfit. Thanks so much for stopping by my blog. Yes, I'd love to follow each other on GFC. Just followed you. Great outfit, I love your ripped jeans! Thanks for the comment on my blog, I would love to follow each other! I'm following you on Bloglovin and GFC now, so I hope you follow back soon!! This oversize sweater looks great with skinny jeans! Oh this is a great look and has a fall feel to it for sure, which is right around the corner! That is a great look and has a fall feel to it which I like. The looks is very cool with the ripped jeans! You always wear amazing pants. I am swooning over this orange babe, it's divine. You look stunning.